Beautiful Meonstoke church and village. We’ve visited the church at Meonstoke before but it reveals more each time we visit and we thought we’d share more images of this beautiful 13th century architecture and of the village which it serves. Meonstoke sits at the heart of the Jutish province of Meonwara. The Anglo Saxon church of Corhampton is close by, just 200m away on the other side of the River Meon. St Andrew’s sits on a mound above the pretty River Meon and manages to keep its feet dry when the river floods. The unusual tower has an Italianate look to it and at its base a 16th century doorway. Inside the church is wide open and filled with light through the rare round clerestory windows which have been placed, unusually in the centre above the pointed Early English arches. The change in architecture from the Norman semi-circular arch to a pointed arch is obvious here in St Andrew’s church. Look carefully at the image of the nave. The chancel arch is semi-circular, i.e Norman, whereas the aisle arches are pointed, post Norman, a period called Early English. So there are possibilities. Could this be a Norman church altered to the new style or was the church built early in the period when the style hadn’t been fully developed and a mixture of styles were adopted? The thinking is, that it was all built at the same time. The font with its simply decorated lead work also dates from the 13th century. Visit both Meonstoke and Corhampton church, enjoy a drink in the Buck’s Head and watch the clear waters of the River Meon pass by. 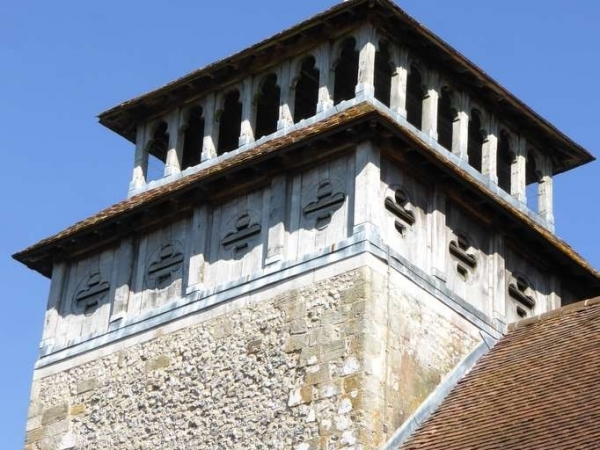 What better way to soak up the history of the Meon Valley?